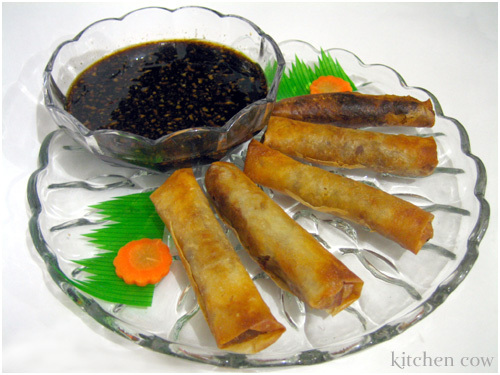 ← Lasang Pinoy 20: Lumpiang Shanghai Binalot! Lasang Pinoy 20: Lumpiang Prito Binalot! Growing up in Sta. Ana, Manila, one of our favorite meryenda (midday snacks) was Pancit Palabok and Lumpiang Prito from the Sta. Ana Market. We’d buy the pancit from our suki since my Mom and her siblings were kids. The lumpia, we’d buy from the store beside the Pancit Palabok vendor. I loved that lumpia. Fried to a golden crisp, and stuffed full of bean sprouts. Unlike the other vendors, her lumpia was only an inch in diameter, making it easier to eat for little mouths. Plus, because it was thinner, you get more lumpia wrapper crunch with every bite, versus the 2-inch thick lumpia of the other stalls. Because it has been years since I last visited the Sta. Ana Market, here is a rough recreation of her Lumpiang Prito. It’s probably a pale copy of the one I grew up with, but it was enough to satisfy my hungry cravings. So until I get the chance to reconnect with my childhood home, I’ll be happy munching on Lumpiang Prito from my current home, making new memories of happy eats and even happier times. Saute the sweet potatoes in oil until almost done. Transfer to a dish, leaving oil in pan. Saute garlic and onions. Add sweet potatoes and bean sprouts. Cook until wilted. Prep the lumpia wrappers by separating each sheet. Spoon a small amount of the mixture on each lumpia wrapper. Amount varies depending on the size of your lumpia wrapper and how thick you want your rolls to be. To wrap, fold the wrapper over the filling and roll once. Fold the sides over the body to seal the sides, then proceed rolling til the end. Dab a bit of water over the flap to seal. To make the sauce, just mix all the ingredients together. Making your lumpia can be a tedious process, especially in a hot kitchen. Still, it is not advisable to work in front of an electric fan because it will make the lumpia wrappers stiffen. If you must work in front of a fan, make sure to keep the wrappers covered or shielded from the fan’s blast. 9 Responses to Lasang Pinoy 20: Lumpiang Prito Binalot! i should remember to bookmark LP on my PC. i didn’t realize the last day for this roundup was on Aug. 1st, sayang. anyway, i love lumpiang prito, i remember having these for mid-afternoon meryenda with vinegar. sarap! Hahaha, yeah, it’s perfect for tirang ginisang togue. Doesn’t taste like leftovers at all! I live in Sta. Ana up until now and I grew up eating from Sta. Ana Market stalls as my Mom sells meat at that market. I practically know all the sellers there (Beth’s Palabok etc.) and I am curious who’s the suki? Basically all the “classic” sellers are still there. And oh, isn’t toyo with suka and lots of onion bits the perfect sawsawan for Sumpia (another term lumpiang toge if im not mistaken)? Awww. I am craving for sumpia tuloy. Tsk. Tsk. Glad to see you make your way here, Jel! I don’t recall our suki’s name, but it’s near the meat sellers. Beth’s near the entrance right? Our suki is the one on the other end of Beth’s row, infront of the candy wholesaler (gawd, I loved that candy store when I was a kid :P). Our Lumpia suki was the one right before her. I didn’t know they called it Sumpia 😀 I learn something new everyday, heehee. And yes, I also add onion at times, depends on how masipag I feel about chopping onions, hwehwe. Hi again. Actually I saw an LJ in one of my fandom comms (a korean band) with your link on it, isn’t that you as well? I can’t remember the name of the lady owner but I am sure I know the suki you are telling me. Her son happened to be my cousin’s stepfather. Small world. And oh, Mang Elmer is the candy shop owner, where I buy La-La chocolate and many piso candy. It’s either Mang Elmer or Chinky, the one who sells lards and butter and everything on wholesale. I remember Lala! And the powder candies you snort through a straw. And the piso meringue! Most especially the piso meringue. Oh, and what fandom comm? I’m not a member of any fandom comm on LJ, methinks. But yeah, I keep a personal LJ account. Kitchencow was originally an LJ account too 😀 What’s yours? Really? O.o But I don’t even know what DBSG is ^_^;; Ah, was the icon a moving gif of various bento boxes or was it an onigiri caricature?